Up the creek………with or without a paddle! 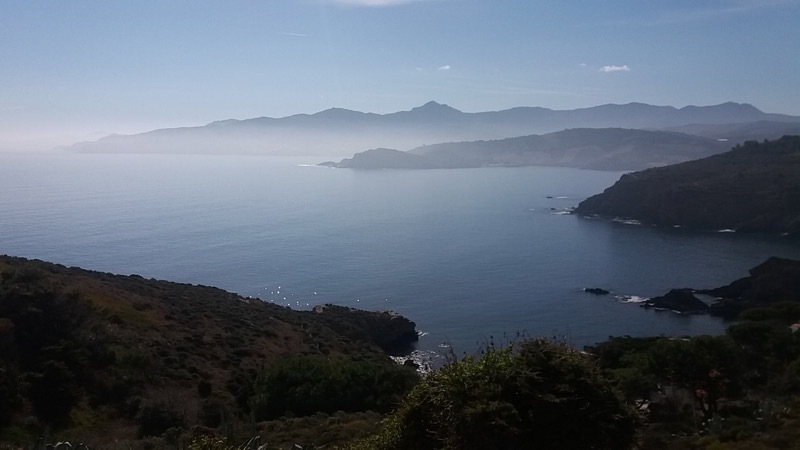 The beaches of the Pyrénées-Orientales, sandy and clean, with daily in-season lifeguard supervision, are a fabulous option for a family day out. Safe and flat, children can run around to their heart’s content with minimum risk. 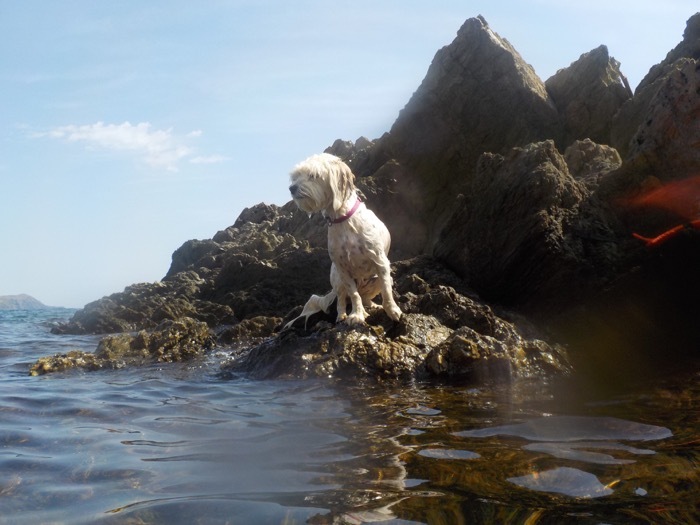 Dogs are not allowed on the supervised parts of the beach so little chance of ’putting your foot in it’ and there are cafés and restaurants within easy reach of all popular beaches. Sometimes, however, it’s nice to get away from the crowds and find an unpeopled hideaway. 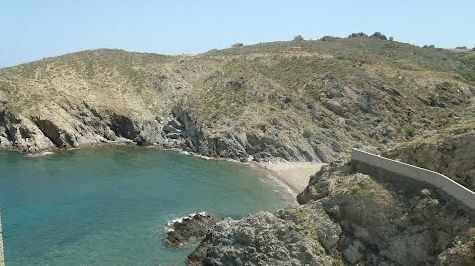 The Pyrénées-Orientales offers dozens of ’criques’ along its rocky coast, small beaches and rocky inlets, usually relatively sheltered from the winds. 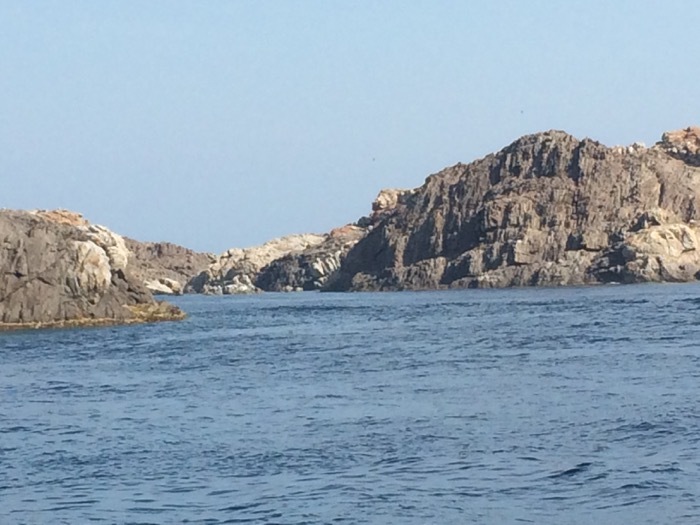 Whilst many of them can be accessed only from the sea, there are many more which are accessible from the land with a reasonable pair of trainers and a rucksack. Well hidden in the heart of a residential housing estate, the Troc Pinell resembles any small Greek fishing cove. This is one of the easiest creeks to get to and can be reached in just a few minutes although the path is often slightly overgrown and you might need to watch where you put your feet! 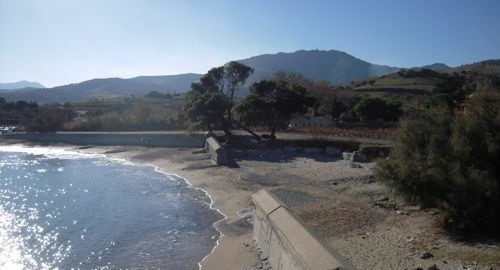 A chain of small creeks, these small sheltered beaches of grey sand used to be dominated by two restaurants, Le Poisson Rouge and Le Gibraltar. The second is now closed, but the Poisson Rouge is still very much open, excellent food if a little pricey, and idyllic setting. 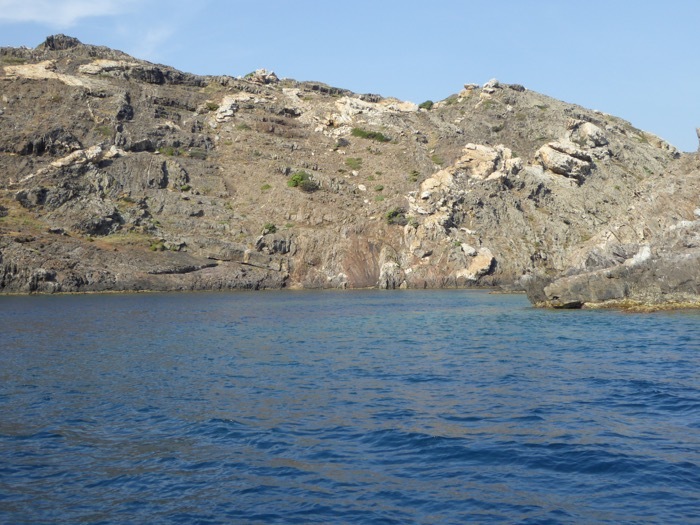 There are many creeks round Cap Béar, most of which are more safely accessed by boat. The last stop for sailors before crossing the frontier into Spain, Cap Béar is also a meteorological centre, with a lighthouse, built in 1905, 27m01 high with a range of 55 km. It is worth visiting for its impressive staircase linking the tower to the guard’s quarters, although you cannot enter the lighthouse, which is fully automated and remote controlled. The many tracks around the lighthouse provide some excellent walks and also lead you down to several creeks. Take care. Cap Béar is infamous for high winds of up to 200mph. Looking down from the lighthouse towards the sea, the remnants of the German blockhouses still remain along with the large round pits which housed the guns, trained on the sea in case of allied invasion from the south. The rusted rails of the large guns are still intact in some areas. Composed of three creeks separated by rocky promontories, L’anse de Paulilles is another poignant reminder of the history of the region. Closed off at the back by a wall built by the Germans in 1943 to try to foil an allied landing, it was also here, in 1875 that Alfred Nobel set up the first nitro-glycerine and explosives factory in France. 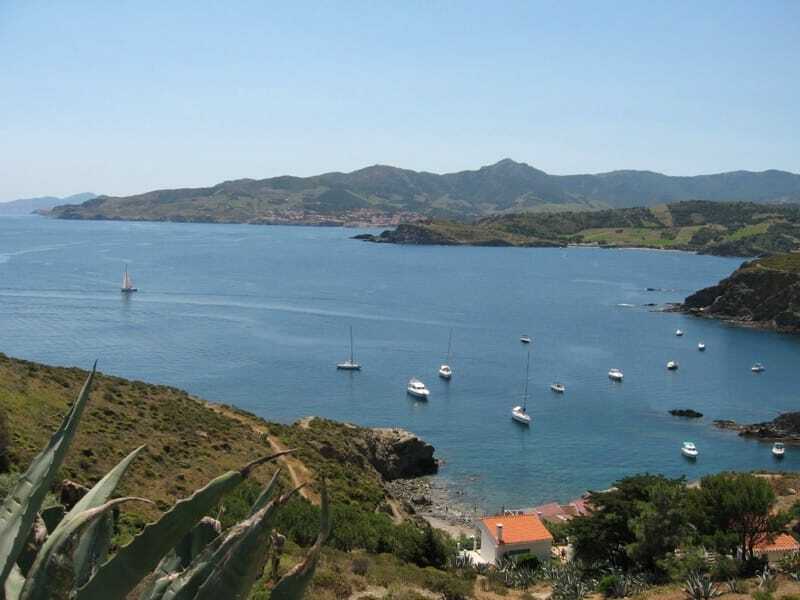 Between Port Vendres and Banyuls, this creek is well signed and easily accessible. The sandy beach is popular and now supervised in high season when it can become quite crowded. There is a shuttle bus from Port Vendres to Paulilles – check with the tourist office for timetables. Access is once again easy to some of these creeks via a car park on the cliff tops, whilst others involve a steepish climb. 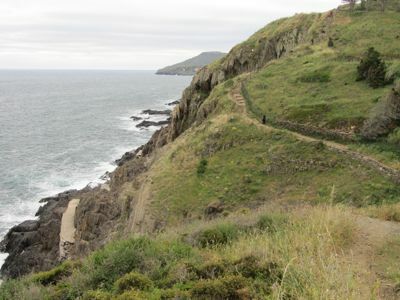 The cliff top itself, overlooking the creeks, is a well known and protected nesting area and many varieties of bird, notably falcons, bluebirds, swallows amongst others, can be spotted in the brushland. Access: coming out of Collioure towards Argelès, just after the large bend, you will see a small, narrow, white bridge on your right (I missed it the first time and had to turn round and go back) Drive under the bridge (follow track round to left) and you will arrive at a car park on the cliffs. The creeks are to both right and left. Take the direction of the lighthouse, which you can’t miss, towards the cliffs, through a housing estate onto very narrow roads (it is possible to take the car up but beware of the many cyclists and walkers) until you arrive at the top of the cliff in a vast dessert of wind blown brush land. From the edge of the cliff, you can look down over the creek, reminiscent of a tropical island with its fine, sandy beach. A path descends to the creek, quite steep but relatively easy to negotiate. 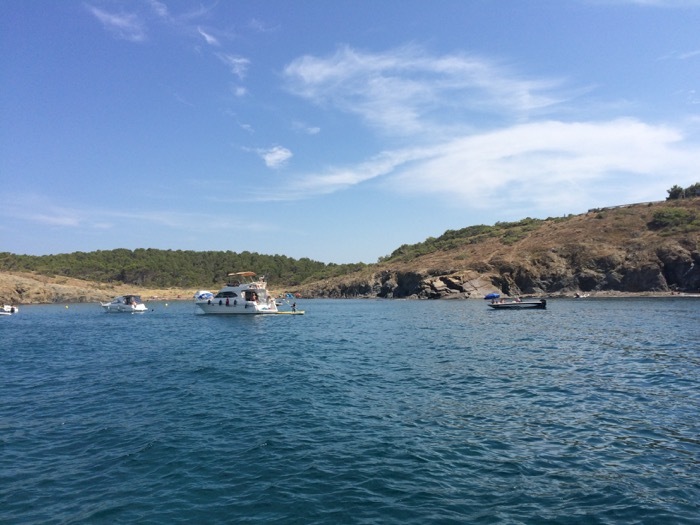 If you are of a nervous disposition, prepare yourself in advance for the naturist cove just near the creek – alternatively, strip off and join them! Look out for the following coloured flags on the beach to find out swimming safety and water conditions.